I love giving gifts. It's one of my biggest love languages, which makes Christmas my favorite holiday ever. But as the years go by, it can be a bit of a struggle to find the perfect gift for everyone. Let's be honest, many of us are very blessed and there's not much that we truly "need" for Christmas, our birthdays, or other special events. And so, the constant dilemma: how do you give a meaningful, fun gift that won't add clutter to a home or be returned? Here's a list of meaningful gift ideas for anyone on your list. While I've got Christmas on my mind now, these gifts could be given year round. Some of them require more time and effort than others, but they're all affordable, show a little thought, and are sure to be loved by anyone who may receive them! Photos are the perfect way to capture life, and what better way to celebrate someone than celebrating life with them in it? If you're like me, you've got tons and tons of pictures, but you don't always want to print all of them. Problem solved with amazing photos gifts to show them off in creative ways: ornaments, canvases, and more. I'm loving anything photo transfer right now, like these super cute transfer ornaments from Landeelu. There's also my personal favorite: a photo map. If you've got lots of photos with your favorite travel buddy, you can make a big map like the one I made in the pin below. Here's how I made it. If you don't have quite so many photos, you could still find some for places you first met, a hometown, where you got married, or where you went to college- then create something cute. This can work really well for birthdays or special events like graduations, but you could easily come up with an awesome video gift for any event. For my hubby's 25th, I made him this video with footage from 25 friends and family members who shared memories and what people love about him. (Excuse the lovey dovey beginning.) Just send a Facebook or text message out, have them send you their footage, and use iMovie to compile. If you've got a "words of affirmation" gift recipient, then this is one of the best gifts you could ever give! Even if it's just you saying something you normally wouldn't, or maybe you can't be at a holiday event this year, videos can be the perfect way for someone to feel your presence (and they also capture your words and face, making them timeless)! I also really love the 1 Second Every Day App. You could take video footage (one second every day), and then compile a video at the end of the year (perfect for Christmas next year) where you could show your special someone a video memory of your entire year together! Totally worth the $2.99 on iTunes. I have one from last year and I can watch all the months tick by in less than 6 minutes. Can you imagine having an entire decade on video- and you can watch it in less than an hour? Some of my very favorite gifts have been tickets to concerts, events, or games. These are the best because they aren't over once a holiday is over- there's still something to look forward to. I seriously will never buy myself a massage, but if someone gives me a gift certificate for one? Best day ever. Remember, these events don't have to be pricey! Board games could even count as an "activity to enjoy". I love to start my initial search with Groupon and scan the "things to do" list for our area. I mean, who wouldn't enjoy a little bubble soccer, wine tasting, or acting like a kid at an trampoline park? If you've got a surprise lover on your list, then you won't find a more meaningful gift than a planned night out (bonus points if you can keep where you're going a secret). My hubby and I try to do this for our birthdays and for special date nights every few months. It can be as simple as reservations at a new restaurant followed by walking around a new part of town. What means the most to those quality time lovers is the gift of uninterrupted time with you that they get to enjoy (without even having to plan it!). 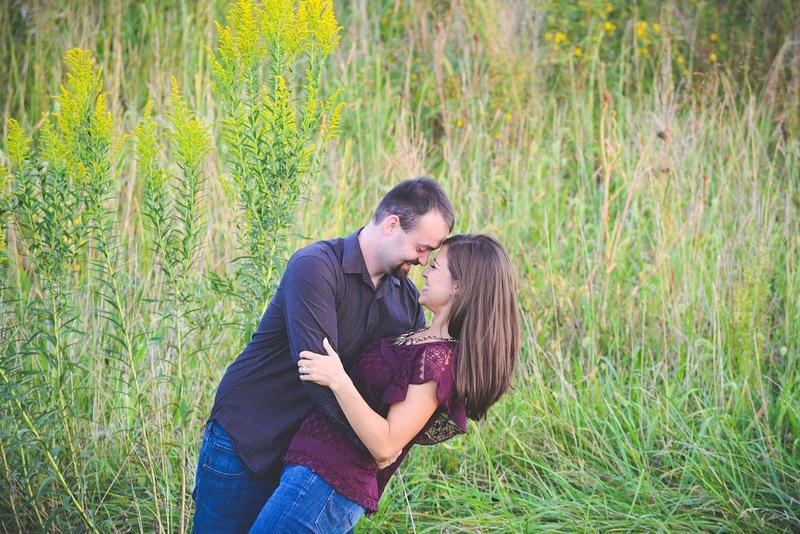 Here are a bunch of ideas from my most popular post ever, Why I'm Still Dating my Husband. Some of our very favorite gifts are ones that take us back to a special time or a special place. They help us celebrate, commemorate, or reminisce about a happy day or a silly event. For those nostalgic gift lovers in your life, consider the gift of your own words, the memories of others, or maybe even finding something that's collecting dust and turning it into a fun way to remember something special. I love these t-shirt canvases, and they would be a super easy way to turn a bunch of t-shirts that never get worn into fun memories and home decor at the same time. I also love these super cute coasters. What a fun way to remember and celebrate a vacation or an amazing adventure you've shared. A thoughtful gift for anyone. You could also try something like Sue at Home did with her 40 Envelopes with 40 Memories for a 40th Birthday. Here's hoping that this list gets you a good jump on your next gift giving opportunity. I've found that the times I've stopped and taken the time to think about and put these plans into action have led to the most wonderful gifts I've ever given. Have questions? Need help pulling one of these gifts off? Let me know. Did you know you can follow along with Currently, Kelsie on Facebook! Give us a like and join the community! I love these ideas! I have such a hard time coming up with gifts sometimes, these are great! I love to come up with unique gifts as well. We just went to Yuletide Celebration with my nieces last night. We try to do an experience with them rather than just buy "stuff". Great ideas here. I love the photo map and video ideas! Last year I made Christmas cards with pictures of my nephews, and added a poem I wrote. Everyone loved them, plus they were quick and not too expensive! Thank you, Acecily! That sounds like such a cute idea- normally it's the least expensive and most thoughtful gifts that are most treasured. All of these are awesome ideas! I'm making a cookbook for all of my family members of all of my favorite recipes! :) Thanks for sharing this post! Thanks, Ariel! That sounds like an amazing gift- I did something similar for my mom one year with all her old recipes. I snuck in and copied them all when she didn't see (guess I loved gift giving from a young age)! Thanks for reading and sharing your idea! The pictures on the map are so adorable! What a great way to showcase pictures in a new way. Thanks for sharing the ideas. These are all great ideas! Thanks for the suggestions. I like the idea of putting together little videos. Thanks for stopping by, Melanie! I hope you can put them to good use! I love love love the little videos- such a fun gift to cherish forever! Wow there are so many things that are awesome here! In my early 20's my dad got me tickets to Cirque de Soleil, he made it into a little date for us, took me out to dinner (SHAVED and held the car door open for me) and bought me a souvenir at the show, I loved it. (Relating to your ideas up above activity to do together and surprise night out. We also got my daughter tickets to Bubble Guppies live for her bday and she loved it! Thanks Hil! Wow, that is so fun and special!! I love how you can totally combine those ideas. I took your advice and linked and pinned up. Thanks for hosting! Love, love, love! The ornament and the 1 second every day are my favorite. I'm a words of affirmation girl above all, so if anyone ever gave me a video compilation, I'd only watch it every day of my life and cry, forever. Oh yay! Thanks, Erin :) Haha- my husband said he had never felt so loved when he got it. I love that he can watch it whenever he needs a little pick me up. I gave my bf a photo book with our biggest memories of our first year together, I knew he'd like it but I wasn't expecting him to love it as much as he does. Guys definitely appreciate personalized gifts a lot more than we give them credit for. I love photo gifts! I am obsessed with Shutterfly and always use it for gifts for those who don't really want or need anything in particular. My Grandpa loves his calendar we make every year! Thanks Amanda!! I totally just signed up for Shutterfly and got all my Christmas card photos for free :) Love it! LOVE LOVE LOVE the TShirt Canvas Idea!!! I might have to do that for myself with all my old college Tshirts! I enjoy creating photo gifts every year. This year I made personalized mugs for my family. :) Great ideas! Oh me too- I totally think it would be such a fun idea for a "man cave" or less formal decorating area. Photo gifts are so fun- thanks for stopping by! Great ideas! Very intrigued by that app, gonna have to check it out! So fun! I love the idea of personal photo gifts of some sort but planned time together or date nights are my favorite. I love when Jordan and I can spend quality time together and having it be a surprise is always a fun treat! I'm a words of affirmation girl too so I love any sort of letters. Great ideas, Kelsie! I love the photo transfer Christmas ornament! That's a gift that can be cherished and passed down through generations! Isn't that soooo cool?? I think it would be awesome to do with older photos!! Last year when our budget was really tight, I put together several date-night boxes for Dustin. One of them was Chopped inspired, another one involved eating spaghetti without regular utensils. It was so fun to create gifts of time! What a great idea :) You're so creative. Thanks for sharing! These are great suggestions, I especially love the activity gift! If you can find something to do with a loved one it's so much more meaningful sometimes than a physical gift. I love the night out idea. We havnt been on a actual date since our baby girl was born. I'm going to find a babysitter and do it- I think my husbadn would really like it! I love them too, Ariel! Calendars are awesome gifts! These are great ideas! I love the coasters of places you've been. Thanks Helen! I thought those were so fun! #3 is my favorite, my family does that each year. And my husband and I take a trip each year before Christmas as part of our gifts. That's so much fun! A trip with hubby sounds amazing right before Christmas! Love these ideas! It's a great change from all the other gift guides out there! Thanks, Shannon! Thanks so much for stopping by and I'm glad you like it! Thank you Julia! It's an awesome app! I really love the photo idea! I have been working on some ideas for where I work! Thanks, Ashley! That would be really fun! Excellent Idea! Love the video gift! Visiting from #intentionaltuesday! Well thanks so much, Kathy! It was so much fun! Such great ideas . I love anything with a personal photo or message. Love that map especially. Thank you Shann! The map has been so much fun!! Great list!! I'm not a big fan of clutter and commercialized Christmas..you know what I mean. 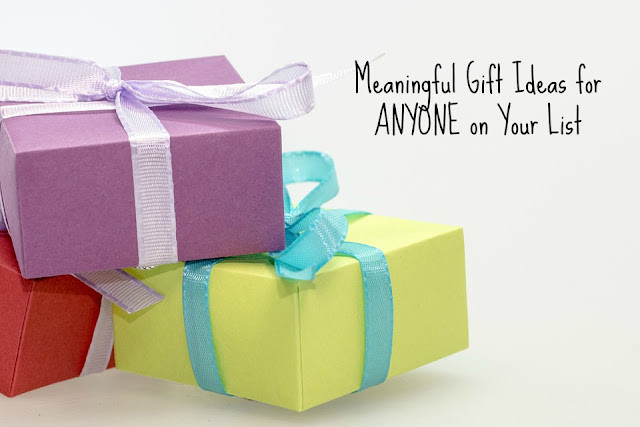 I'd really really have meaningful gifts, like what is in your list. Thank you for sharing this over at #Bloggerspotlight. Hope to see you again! Pinned! So fun! I love all of these ideas Kelsie!!! Thank you and thanks so much for reading, Lisa! I really appreciate these gift ideas. This year, I am all about trying to find something meaningful and inexpensive. Thanks for sharing them! I love the video idea! And it really doesn't cost anything except time to make! (Those are my favorite.) Thanks for sharing. Thanks so much, Lindsey! I love those too :) Thanks for reading! I love giving gifts too, and these are some amazing gift ideas!! :-) Yoyr blog is great! Thanks so much, Cathy! That means a lot! Love the future date night idea! I've been thinking about making a package for the year. Like a date night planned for each month! Thank you Jessica! That's a great idea!! Oh yay! That's what I was going for- gifts that could be used year round. Thanks for stopping by! Wonderful, creative ideas! Thanks for the inspiration. You're so welcome, Ashlee! Thanks for stopping by! I love this post (especially since I had one just like it in my drafts for a while :) )! Oh yay!! Thank so much :) I'm so glad you enjoyed it. Merry Christmas! I did that coasters thing with engagement pictures as a gift for my husband's birthday before we were married. Years later, we're still using them and we get so many complements! I love the idea of doing something fun for a gift. My aunt did that for the birthdays I had growing up. I remember those events more than any gift I got as a child. Great ideas! I love your travel related ones (like the photo map and coasters). Though my biggest draw is ALWAYS experiences. I am not much of a 'things' person, so if someone takes me out for coffee for my birthday, I'll appreciate the three dollars they spent on that drink and spending time with me much more than I'd appreciate a three dollar card that I'd throw away a week later. That's just me though :) Love these ideas! Thank you Joy! I love experiences too, and so agree with the coffee date point! Amazing ideas! I have been looking into photo gifts for many family members! Thanks, girl! I love photo gifts so much! Great suggestions! I always try to be unique with the gifts I give! Agreed, Rachel! It is so much fun! That's so true! Thanks for reading! I love giving creative photo gifts -- I'm actually going to be making my mom a calendar as a stocking stuffer with pictures from this year. That's so fun! I find that creative photo gifts are some of the most loved! I think I am going to go the route of photo gifts for several people on my list this year! I just need to start the orders so I have enough time!